I made a review of Leopard Workshop’s first run of this kit a few weeks ago. In this review I pointed out that the inner wheels left a gap between the hole for the axel of the inside wheel and the attachment pin/axel from the arm of the road wheel. Michaels comment was in one word not mentionable here and then he decided to rework the set. I really wish other producers would react the same way. This review is therefore of the new kit which replaces the first review. Buyers will not have to be afraid to mistakenly order one of the first run kits, as they are not available anymore. All kits have had their inner wheels replaced with a new and improved one. All wheels have been computer designed and produced from a 3D printed master. They are cast in a cream colored resin with very little to clean. In my photos I’ve enhanced the details by giving the parts a wash of Tamiya Panel Line Accent Color. My samples had no air bubbles or any flaws. The resin is a little softer than I am use to; however, this is not a problem just something you have to be aware of while cleaning the parts. A very thorough instruction is included. This provides instructions for both Tamiya and Hobby Boss versions of the Leopard 2 tank. The only adjustment needed between the different donor kits is the axel hole and the instructions clearly give advice to this. Even if I haven’t tried it yet myself, I am sure one could use these on a Revell offering as well. The wheels are the standard wheels for the Leopard 2 tank and should therefore be appropriate for most Leopard 2 tanks. The level of detail on these wheels is very high; especially compared to the Hobby Boss offering. The outside wheels have very clearly cast nuts and attachment disk and the curved shave of the rim looks very good indeed. This is particularly clear on the idler wheels. 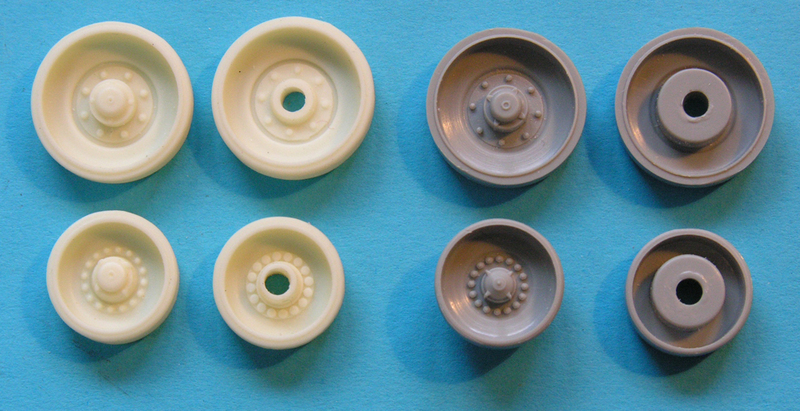 However, what really would make your Leopard 2 model stand out in a crowd are the inside wheels. You cannot find any replacement kits with a detailed inside version. Why spend money on etch, replacement barrels etc. and live with inside wheels that looks like toy “thingies”? The level of detail on the inside is the same as on the outside ones. I am glad to point out that the “bug” of the previous run has been fixed. The inner wheels now have a longer stud and there is no gaps any more as my accompanying photo shows. I do not have an unused Tamiya road wheel arm anymore, but from the first review I know that the attachment pin of Tamiya’s kit in length is equal to that of Hobby Boss. The attachment is hence trouble free for both brands and not visible once in place. Leopard Workshop offers a very high quality set of replacement wheels for almost all Leopard 2 tanks. The set will increase the level of details in an area mostly ignored by other AM producers. I would like to express my admiration for Leopard Workshop’s quick and resolute response to the points I made on the first run of the kit. Thumbs up for this Michael. I highly recommend this kit for any modeler who wish to add details to a Leopard 2 model. Highs: Clear and accurate details. Details in an area usually ignored by other AM manufactors. Lows: Sorry – can’t really find any??? Verdict: A very good kit worth every euro-cent it costs. Highly recommendable. Copyright ©2019 text by kenneth oestergaard [ KEO ]. All rights reserved. Based on a actual image of Leopard 2 wheels The Hobby Boss wheels look more like the real thing (Hobby Boss on right, Leopard Workshop on left) To me kit wheels are more then sufficient and the extra expense not needed. You've posted an image of Leopard C2 road wheels...fail. Damn internet lied to me again.....LOL Oops my bad, the image listed the wheels as Leopard 2 wheels. Sorry. here is an image from Prime Portal for a Leopard 2A6, and the ones from Leopard Club still don't quite match. There are raised areas coming out of the center hub, and the grove around the lug nut plate does look as deep. Based on this image, neither are correct. Is it possible there are two different axle hubs for the Leopard 2? Here is an image of a Leopard 2 in Singapore, notice the hubs don't match. Yes, it is possible to have different wheels on these beasts..certainly more prevalent on the Danish, Canadian and Norwegian Leopard 1's but still present on 2's in some cases. I found the wheels to be a nice improvement to the kit supplied wheels...I will go out on a limb and say over all of them. I used them to replace the PSM wheels on an AEV. The detailing on the PSM wheels were nice, being only on the exterior, but the wheels were undersized in diameter. The demarcation between the rim and the rubber on the Leopard Club wheels was better, the bolt details are present on the inside (which does get seen once built) and the correct diameter....at least form what I found. Only thing I didn't like about the Hobby Boss was the bolt flanges are triangular in nature where the Leopard Club Wheels are rounded. But that is just my opinion!